It’s August, which means most of us are thinking about the start of school, even those of us who aren’t in school as students or teachers (think traffic). 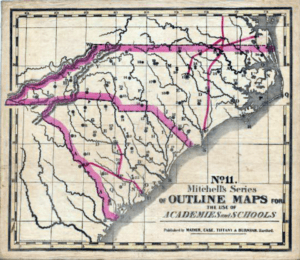 Let’s take a look at a few very scarce 19th Century published school maps of North Carolina. Although school geography texts and atlases were plentiful in the 19th Century, most of them had only regional maps.1 Some had only continental maps. 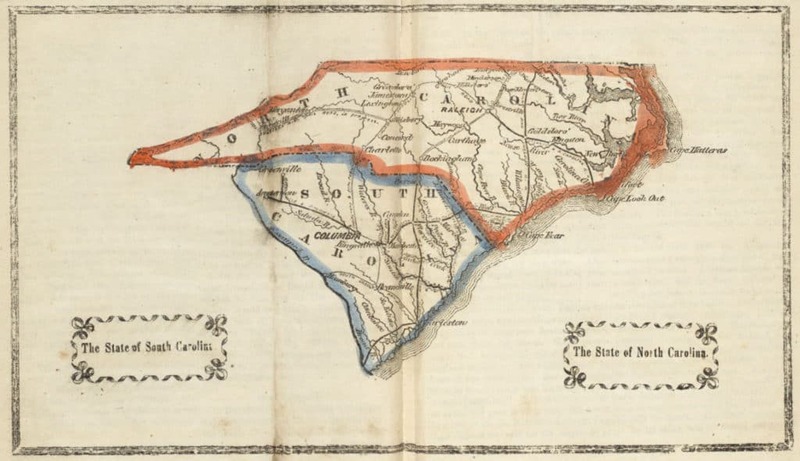 We’re going to focus on a few that contained a map of North Carolina, or of the two Carolinas. The map above was published in A geography for schools : upon a plan entirely new… by Luke Drury, (printed by Miller & Hutchens, Providence, RI, 1822).2 One map dealer’s web site, invoking the most extreme hyperbole, states that “Drury was a preeminent mapmaker of the early 19th century, and his state maps in particular were noted for their quality and accuracy…”3 However, this school geography/atlas seems to be the only cartographic work attributed to Luke Drury (b1794-d1845). 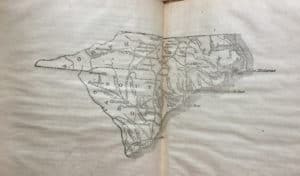 One author’s description of a Drury map as “primitive” paints a more accurate picture.4 Only one state of the Drury map of North Carolina is known. The town locations and river systems are reasonably accurate, but the map is sparse in its detail. Obviously, some sparseness is to be expected for the small size of this map. Neither county boundaries, county names, nor roads are shown, and the towns of Salisbury and Charlotte, amongst many others, are omitted. The map shown below was published in 1822 by Henry Charles Carey & Isaac Lea, in The Juvenile Atlas or a Series Of Maps, To Illustrate the Old and New Worlds… (Philadelphia, PA). The map was likely drawn by John Graeme Melish. Compared to Drury’s map of the same year, the map from Carey & Lea’s Juvenile Atlas shows many more towns. The delineation of the rivers may be improved slighty, but the NC/TN boundary is a little less accurate than depicted by Drury. The Carey & Lea map exists in three states, but only the first state, the rarest of the three states, was used in a school atlas. For a more detailed discussion of the different states of N.&S. Carolina and Georgia, please click here. These maps measured about two feet diameter, were backed with linen, and had two small rings attached on the verso so they could be hung in the classroom. A “Revised & Improved” series of maps was published in 1848, apparently limited to the maps of the U.S., world, and continents, and not including the state maps. 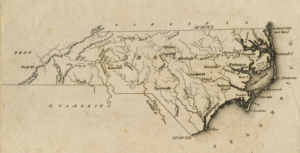 The “Key” book is available on line; here is a link to the page with the key to the number & letter symbols on Map No.11 of North Carolina/South Carolina. 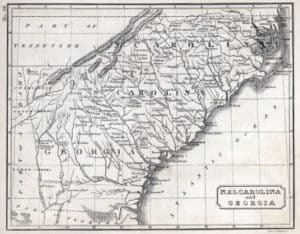 Untitled map of North Carolina and South Carolina from The Geographical Reader for the Dixie Children, 1863. Like Drury’s maps, the maps in Moore’s Geographical Reader have a primitive style. 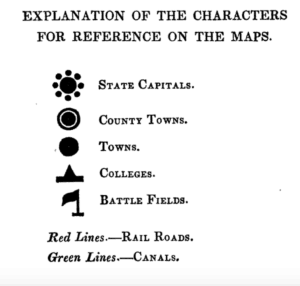 However, Moore’s maps include more towns and show important roads and railroads. The entire text of Moore’s geographical reader is available on line. Moore, Marinda Branson. 1864. Primary Geography, arranged as a Reading Book for common schools : with Questions and Answers Attached By M. B. Moore. Osher Map Library and Smith Center for Cartographic Education, University of Southern Maine: http://www.oshermaps.org/container?id=6753, accessed 13 December 2017. School is about to start, so we’ll stop for now so that you can go study your geography. Your first assignment is an excellent history of “Marinda Branson Moore’s Dixie Geography”, available on line here. If you have any questions, comments, or corrections, please use the “What’s on your mind?” option below. “A Checklist of Tennessee Maps, 1820-1830”, Wells, Ann Harwell. Tennessee Historical Quarterly; Nashville; 43.3 (Fall 1984): 209. “Books Made in Dixie”, Albright, James W.; Southern Historical Society Papers, XLI (September 1916), 57-60. Parrish and Willingham, Confederate Imprints, entries 7806 & 7807. This entry was posted in 19th Century and tagged Carey & Lea, Confederate imprint, Luke Drury, Marinda Branson Moore, school maps by crmaps. Bookmark the permalink.